Not to be confused with Sharaf al-Dīn al-Ṭūsī. Muhammad ibn Muhammad ibn al-Hasan al-Tūsī (Persian: محمد بن محمد بن حسن طوسی‎‎ 24 February 1201 – 26 June 1274), better known as Nasir al-Din Tusi (Persian: نصیر الدین طوسی‎; or simply Tusi /ˈtuːsi/ in the West), was a Persian polymath, architect, philosopher, physician, scientist, and theologian. He established trigonometry as an independent branch of mathematics. He was a Twelver Shia Muslim. Ibn Khaldun (1332–1406) claimed Tusi was the greatest of the later Persian scholars. Al-Tūsī was born in the city of Tus, Khorasan (now in northeastern Iran) in the year 1201 and began his studies at an early age. 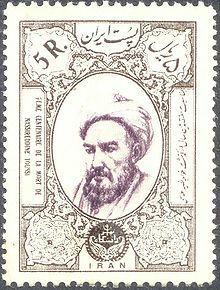 In Hamadan and Tus he studied the Quran, hadith, Ja'fari jurisprudence, logic, philosophy, mathematics, medicine and astronomy. Muhammad al-Tūsī's family was Shī‘ah. His father, who died while Muhammad was a only boy, had, according to his Islamic faith, encouraged his son to study. Al-Tūsī took the acquisition of knowledge very seriously and traveled far and wide attending the lectures of renowned scholars. At a young age, he moved to Nishapur to study philosophy under Farid al-Din Damad and mathematics under Muhammad Hasib. He met also Attar of Nishapur, the legendary Sufi master who was later killed by the Mongols, and he attended the lectures of Qutb al-Din al-Misri. In Mosul al-Tūsī studied mathematics and astronomy with Kamal al-Din Yunus (d. AH 639 / AD 1242), a pupil of Sharaf al-Dīn al-Ṭūsī. Later he corresponded with Sadr al-Din al-Qunawi, the son-in-law of Ibn Arabi, and it seems that the mysticism of the Sufi masters of his time, did not appeal to him. However he composed his own manual of philosophical Sufism in the form of a small booklet entitled Awsaf al-Ashraf "The Attributes of the Illustrious". As the armies of Genghis Khan swept across his homeland, al-Tūsī was employed by the Nizari Ismaili state. His most important contributions to science were made while he moved from one stronghold to another. He was captured after the invasion of Alamut Castle by the Mongol forces. While in Nishapur, al-Tūsī established a reputation for scholarship. He composed over 150 prose works, and his diwan (collected works) is one of the largest by any Muslim author. Writing in Arabic and Persian, Nasir al-Din Tusi treats religious ("Islamic") and secular subjects ("the ancient sciences"). He translated the works of Euclid, Archimedes, Ptolemy, Autolycus, and Theodosius of Bithynia into Arabic. The Astronomical Observatory of Nasir al-Dīn Tusi. When al-Tūsī convinced the Mongol conqueror Hulegu Khan to build an observatory for purpose of producing accurate astronomical tables, it was the most technically advanced in the world. Astronomical charts were used in astrological predictions and to calculate the dates of religious festivals, in addition to many other civil, military and navigational applications. Begun in 1259, the Rasad Khaneh observatory was constructed in Azarbaijan, south of the river Aras and west of Maragheh, the capital of the Ilkhanate Empire. 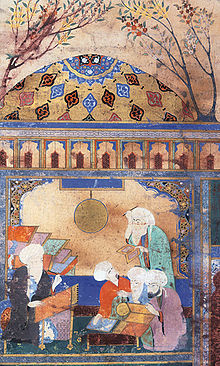 Using the sophisticated measurements taken at the observatory Al-Tusi's highly accurate astronomical tables of planetary movements are depicted in his book Zij-i ilkhani (Ilkhanic Tables). His tables calculating the positions of the planets and the names of the stars and his model for the planetary system, the most scientifically advanced of its time, were in use until the development of the heliocentric model in the time of Nicolaus Copernicus. Between Ptolemy and Copernicus, he is considered one of the most eminent astronomers. His famous student Shams ad-Din Al-Bukhari  taught the Byzantine scholar Gregory Chioniadis, who had in turn trained the astronomer Manuel Bryennios  about 1300 in Constantinople. The Tusi-couple is a geometrical technique invented by al-Ṭūsī to generate linear motion from the sum of two circular motions and is used in his planetary models. The technique replaced Ptolemy's problematic equant for many planets, but was unable to find a solution to Mercury, which was solved later by Ibn al-Shatir as well as Ali Qushji. The Tusi couple was later employed in Ibn al-Shatir's geocentric model and Nicolaus Copernicus' heliocentric Copernican model. He also calculated the value for the annual precession of the equinoxes and contributed to the construction and usage of some astronomical instruments including the astrolabe. Al-Ṭūsī noted that Ptolemy's observations for the Earth's being at rest, were not evidence of proof. However while he too believed in a fixed earth, as did his 16th-century commentator al-Bīrjandī, he insisted only the physical principles based on natural philosophy could be relied upon. Tusi's criticisms of Ptolemy were similar to the arguments later used by Copernicus in 1543 to defend the Earth's rotation. On the real essence of the Milky Way, Ṭūsī in his Tadhkira writes: "The Milky Way, i.e. the galaxy, is made up of a very large number of small, tightly-clustered stars, which, on account of their concentration and smallness, seem to be cloudy patches. because of this, it was likened to milk in color." Three centuries later the proof of the Milky Way consisting of many stars came in 1610 when Galileo Galilei used a telescope to study the Milky Way and discovered that it is really composed of a huge number of faint stars. "What spurred him to this was that in the assertoric syllogistic Aristotle and others sometimes used contradictories of absolute propositions on the assumption that they are absolute; and that was why so many decided that absolutes did contradict absolutes. When Avicenna had shown this to be wrong, he wanted to develop a method of construing those examples from Aristotle." Al-Tusi's extensive exposition Treatise on the Quadrilateral, distinguish spherical trigonometry from astronomy. It was in the works of Al-Tusi that trigonometry achieved the status of an independent branch of pure mathematics distinct from astronomy, to which it had been linked for so long. He created a list of six cases for the right triangle in spherical trigonometry. His discoveries in spherical trigonometry followed the tradition of earlier Greek mathematicians such as Menelaus of Alexandria, who wrote Sphaerica, and the Muslim mathematicians Abū al-Wafā' al-Būzjānī and Al-Jayyani. In his Akhlaq-i Nasiri, Tusi wrote about several biological topics. He defended a version of Aristotle's scala naturae, in which he placed man above animals, plants, minerals, and the elements. He described "grasses which grow without sowing or cultivation, by the mere mingling of elements," as closest to minerals. Among plants, he considered the date-palm as the most highly developed, since "it only lacks one thing further to reach (the stage of) an animal: to tear itself loose from the soil and to move away in the quest for nourishment." "The noblest of the species is that one whose sagacity and perception is such that it accepts discipline and instruction: thus there accrues to it the perfection not originally created in it. Such are the schooled horse and the trained falcon. The greater this faculty grows in it, the more surpassing its rank, until a point is reached where the (mere) observation of action suffices as instruction: thus, when they see a thing, they perform the like of it by mimicry, without training [...]. This is the utmost of the animal degrees, and the first of the degrees of Man in contiguous therewith." Al-Tusi's biological writings have been interpreted as a kind of proto-evolutionary theory. However, Tusi did not state explicitly that he believed species to change over time. Al-Tusi's main contribution to chemistry, is his formulation of an early law of conservation of mass. A 60-km diameter lunar crater located on the southern hemisphere of the moon is named after him as "Nasireddin". A minor planet 10269 Tusi discovered by Soviet astronomer Nikolai Stepanovich Chernykh in 1979 is named after him. The K. N. Toosi University of Technology in Iran and Observatory of Shamakhy in the Republic of Azerbaijan are also named after him. In February 2013, Google celebrated his 812th birthday with a doodle, which was accessible in its websites with Arabic language calling him al-farsi (the Persian). Of about 150 works al-Tusi wrote, 25 were in Persian, the remaining in Arabic, and one treatise in Persian, Arabic and Turkish. Al-Tadhkirah fi'ilm al-hay'ah – A memoir on the science of astronomy. Many commentaries were written about this work called Sharh al-Tadhkirah (A Commentary on al-Tadhkirah) - Commentaries were written by Abd al-Ali ibn Muhammad ibn al-Husayn al-Birjandi and by Nazzam Nishapuri. Talkhis al-Muhassal (summary of summaries). Maʾkhūdhāt mansūba ilā Arshimīdis (مأخوذات منسوبة إلى أَ ْرشَمِيْدس); a Latin-English translation by John Greaves titled Lemmata Archimidis e vetusto codice manuscripto Arabico (London, 1659) introduced the work into Europe. makes the steed of intelligence leap over the vault of heaven. can bring his lame little donkey to the destination nonetheless. is stuck forever in double ignorance. ^ Bennison, Amira K. (2009). The great caliphs : the golden age of the 'Abbasid Empire. New Haven: Yale University Press. p. 204. ISBN 978-0-300-15227-2. Hulegu killed the last ‘Abbasid caliph but also patronized the foundation of a new observatory at Maragha in Azerbayjan at the instigation of the Persian Shi‘i polymath Nasir al-Din Tusi. ^ Seyyed Hossein Nasr (2006). Islamic Philosophy from Its Origin to the Present: Philosophy in the Land of Prophecy. State University of New York Press. p. 167. ISBN 978-0-7914-6800-5. In fact it was common among Persian Islamic philosophers to write few quatrains on the side often in the spirit of some of the poems of Khayyam singing about the impermanence of the world and its transience and similar themes. One needs to only recall the names of Ibn Sina, Suhrawardi, Nasir al-Din Tusi and Mulla Sadra, who wrote poems along with extensive prose works. ^ Laet, Sigfried J. de (1994). History of Humanity: From the seventh to the sixteenth century. UNESCO. p. 908. 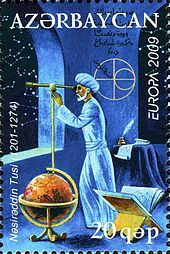 ISBN 978-92-3-102813-7. the Persian astronomer and philosopher Nasir al-Din Tusi. ^ electricpulp.com. "ṬUSI, NAṢIR-AL-DIN i. Biography – Encyclopaedia Iranica". www.iranicaonline.org. Retrieved 2018-08-05. His greatest contribution to mathematics (Nasr, 1996, pp. 208-14) was establishing a new discipline of trigonometry. He developed spherical trigonometry and the six fundamental formulas for the solution of spherical right-angled triangles. ^ a b c H. Daiber, F.J. Ragep, "Tusi" in Encyclopaedia of Islam. Edited by: P. Bearman, Th. Bianquis, C.E. Bosworth, E. van Donzel and W.P. Heinrichs. Brill, 2007. Brill Online. Quote: "Tusi's prose writings, which number over 150 works, represent one of the largest collections by a single Islamic author. Writing in both Arabic and Persian, Nasir al-Din dealt with both religious ("Islamic") topics and non-religious or secular subjects ("the ancient sciences")." ^ Morris Rossabi (28 November 2014). From Yuan to Modern China and Mongolia: The Writings of Morris Rossabi. BRILL. pp. 281–. ISBN 978-90-04-28529-3. ^ Ragep, F. Jamil (2001), "Freeing Astronomy from Philosophy: An Aspect of Islamic Influence on Science", Osiris, 16, 2nd ser. : 49–64, Bibcode:2001Osir...16...49R, doi:10.1086/649338, JSTOR 301979 , at p. 60. ^ F. Jamil Ragep (2001), "Tusi and Copernicus: The Earth's Motion in Context", Science in Context 14 (1-2), p. 145–163. Cambridge University Press. ^ O'Connor, J. J.; Robertson, E. F. (November 2002). "Galileo Galilei". University of St Andrews. Retrieved 2007-01-08. ^ "trigonometry". Encyclopædia Britannica. Retrieved 2011-04-25. ^ * Katz, Victor J. (1993). A History of Mathematics: An Introduction, p259. Addison Wesley. ISBN 0-673-38039-4. ^ Bosworth, Clifford E.; Asimov (2003). History of civilizations of Central Asia. 4. Motilal Banarsidass. p. 190. ISBN 81-208-1596-3. ^ Hayes, John R.; Badeau, John S. (1983). The genius of Arab civilization : source of Renaissance (2nd ed.). Taylor & Francis. p. 156. ISBN 0-262-08136-9. ^ a b Berggren, J. Lennart (2007). "Mathematics in Medieval Islam". The Mathematics of Egypt, Mesopotamia, China, India, and Islam: A Sourcebook. Princeton University Press. p. 518. ISBN 978-0-691-11485-9. ^ a b Nasir ad-Din Tusi (1964) The Nasirean Ethics (translator: G.M. Wickens). London: Allen & Unwin, p. 44. ^ Nasir ad-Din Tusi (1964) The Nasirean Ethics (translator: G.M. Wickens). London: Allen & Unwin, p. 45. ^ Nasir ad-Din Tusi (1964) The Nasirean Ethics (translator: G.M. Wickens). London: Allen & Unwin, p. 45f. ^ Nasir ad-Din Tusi (1964) The Nasirean Ethics (translator: G.M. Wickens). London: Allen & Unwin, p. 42 (emphasis added). ^ Alakbarli, Farid (Summer 2001). "A 13th-Century Darwin? Tusi's Views on Evolution". Azerbaijan International. 9 (2): 48–49. ^ Shoja, M.M. ; Tubbs, R.S. (2007). "The history of anatomy in Persia". Journal of Anatomy. 210: 359–378. doi:10.1111/j.1469-7580.2007.00711.x. PMC 2100290. ^ Alakbarli, Farid (2001). "A 13th-Century Darwin? Tusi's Views on Evolution". Azerbaijan International. 9 (2 (Summer 2001)): 48–49. Retrieved 27 January 2018. While this reasoning may seem backward to today's Western mind, some of Tusi's theories did have merit. For instance, Tusi believed that a body of matter is able to change, but is not able to entirely disappear. He wrote: 'A body of matter cannot disappear completely. It only changes its form, condition, composition, color and other properties and turns into a different complex or elementary matter'. ^ "2003ASPC..289..157B Page 157". Adsabs.harvard.edu. Retrieved 2013-02-27. ^ 10269 tusi - Mano biblioteka - Google knygos. Books.google.com. Retrieved 2013-02-27. ^ "Nasir al-Din al-Tusi's 812th Birthday". Google. Retrieved 19 February 2013. ^ "In Persian نگاه عربی به خواجه نصیرالدین طوسی در گوگل". 19 February 2013. Retrieved 19 February 2013. ^ Seyyed Hossein Nasr. The Islamic Intellectual Tradition in Persia. Curson Press, 1996. See p. 208: "Nearly 150 treatises and letters by Nasir al-Din Tusi are known, of which 25 are in Persian and the rest in Arabic. There is even a treatise on geomancy which Tusi wrote in Arabic, Persian, and Turkish, demonstrating his mastery of all three languages." "Ṭūsī, Muḥammad Ibn Muḥammad Ibn al-Ḥasan". Dictionary of Scientific Biography. New York: Charles Scribner's Sons. 1970–80. ISBN 978-0-684-10114-9. O'Connor, John J.; Robertson, Edmund F., "Nasir al-Din Tusi", MacTutor History of Mathematics archive, University of St Andrews . "Nasir al-Din al-Tusi (Persian scholar) -- Encyclopædia Britannica". britannica.com. Retrieved 16 January 2014.